Coronal holes are places where the sun's magnetic field opens up and allows solar wind to escape. 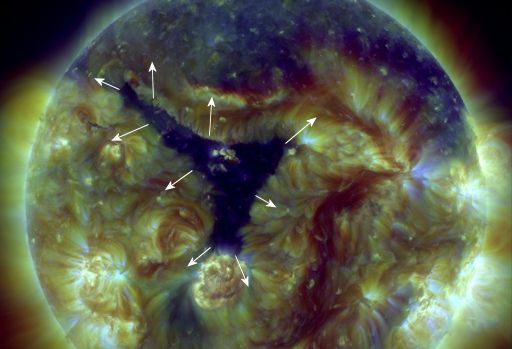 A stream of solar wind flowing from this particular coronal hole will reach Earth on June 29-30. Because the coronal hole is straddling the sun's equator, the solar wind it is sending our way should make a direct hit on our planet's magnetic field. The impact could spark geomagnetic storms around the poles. High-latitude sky watchers should be alert for auroras at the end of the month. Aurora alerts: text, voice.